More and more we find our clients are looking for an automated technology solution to bridge the gap between PeopleSoft and their Applicant Tracking System (ATS). 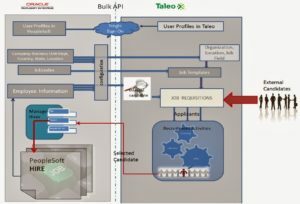 During a recent implementation of Taleo, a global PS WebSolution customer required a solution that would include not only requisition data, but also integrate PeopleSoft Job and Position Profile data with their PS WebSolution HR SmartForm application. The PS WebSolution Auto-Requisition module allows requisition data to be part of the HR SmartForm which provides the ability to edit and create new positions for their employees and a contingent workforce. This data is then integrated with various Applicant Tracking Systems to automatically create requisitions in a single transaction. Using the PS WebSolution Auto-Requisition module, the client was able to integrate PeopleSoft Profile (Job and Position) data into their HR SmartForms via its user friendly user interface and guided wizards. This allowed managers and administrators to request changes to PeopleSoft Position and Profile data, including the Position Description, Skills, Qualifications and other content items, before pushing the data to Taleo to automatically create the requisition within Taleo. PS WebSolution’s HR SmartForms and the Auto-Requisition module provide the flexibility to enable most business processes via configuration; allowing transactions to seamlessly flow directly to the ATS system upon final approval, in real-time, while providing users the ability to easily track the status throughout the entire requisition process. Applicants that are marked for hire in the ATS are then sent back into PeopleSoft for the hiring manager to accept via an online portal pagelet. Want to simplify your process? Click Here to request a demonstration.